Our friends at the Larner College of Medicine at the University of Vermont gathered together a few dozen researchers yesterday to present findings from fall 2017 studies and projects. 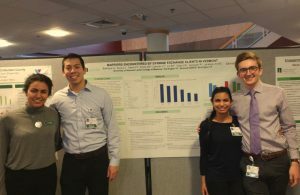 We were proud to again partner with some of the finest future leaders in healthcare, and are grateful for our team of 7 medical students who investigated both barriers to new services and what services would be best suited for the main regions we serve through fixed-site syringe support services (Barre, Rutland, and St. Johnsbury, Vermont). Each year we learn something new from this group of students, and try to take action on their recommendations and findings promptly. We plan to roll out some of the proposed program upgrades in the coming months, so keep an eye out.